In Time Geography, the artist’s role is akin to that of a cartographer, creating tangible social objects to be read as alternative interpretations of our culture in motion. – offers an alternative model of production to current fashion consumption. 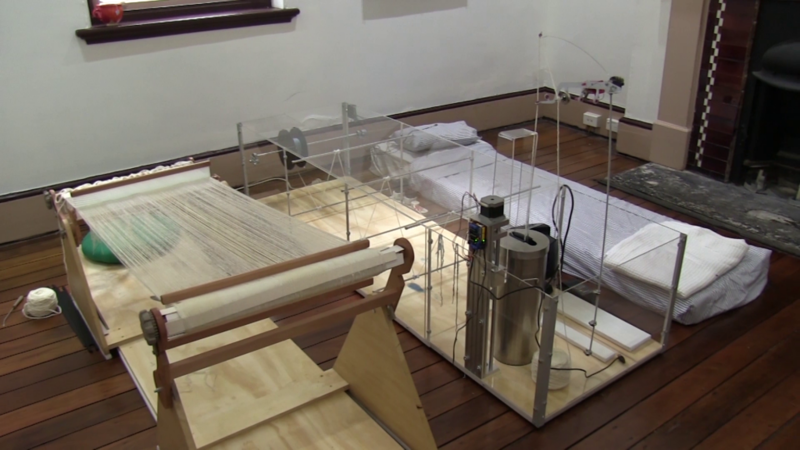 First, Flanagan created a portable dying/weaving/sleeping machine, guided by principles of Humanistic Intelligence and coupled with the body’s biometrics, in order to generate textiles. Documentation of the machine/body installation in the interactive process of generating blankets – biometric traces as tangible social objects to cover the body – can be viewed via the link below. The BODY ecology installation and the blankets generated through the performance together form an exploratory response to the activity of tracking twelve months of the body in motion and at rest. 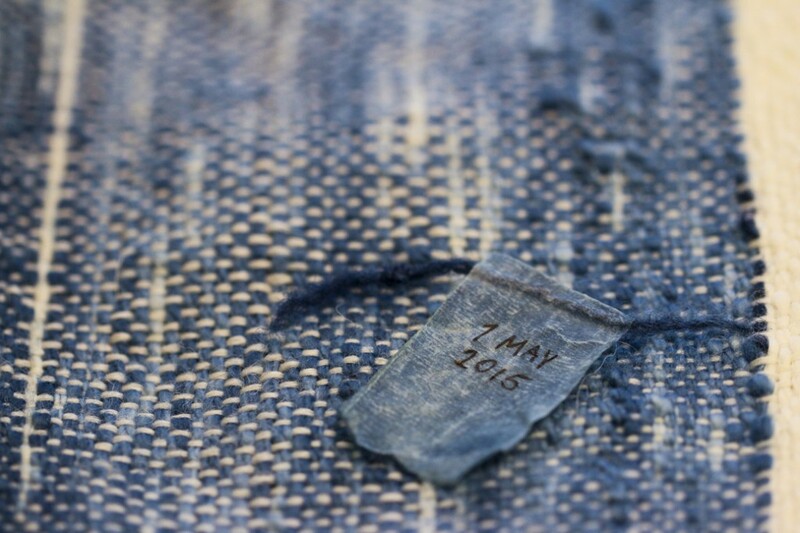 – Time Topography at Timeless Textiles, Newcastle Australia 15 July – 16 August 2015. – Experimental Thinking / Design Practices at Griffith University Art Gallery, Australia 18 September – 7 November 2015. – WearNEXT at AVA Gallery, Choi Hung, Hong Kong, 25 March 1 – 31, 2016. Tricia Flanagan. “BODY ecology” 2015, Installation, dimensions variable, Timeless Textiles, Newcastle Australia, Photo courtesy of the artist, ©Tricia Flanagan. Flanagan then created a second system in the form of an installation consisting of a portable knitting machine connected to data from walking/geo-tagging/and sensing temperature and humidity in order to generate body coverings. A collection of twelve garments was produced using the artists’ body biometrics/ location/ temperature and humidity. Corresponding collections are to be produced in collaboration with travellers from across the globe. Time Geography explores the topography of the body and its tempo-spatial relationship to systems that surround it. Walking and sleeping self-generate clothing and blankets, changes in the environment leave visible traces in colours and textures in textiles – much like the growth rings of a tree or traces of sunburn on the skin. In this sense, travelling generates bespoke garments unique to the body and environments from which they emerge. Time Geography is therefore a system of clothing and textiles production that is determined by the body’s mobility and the environmental climate surrounding it. 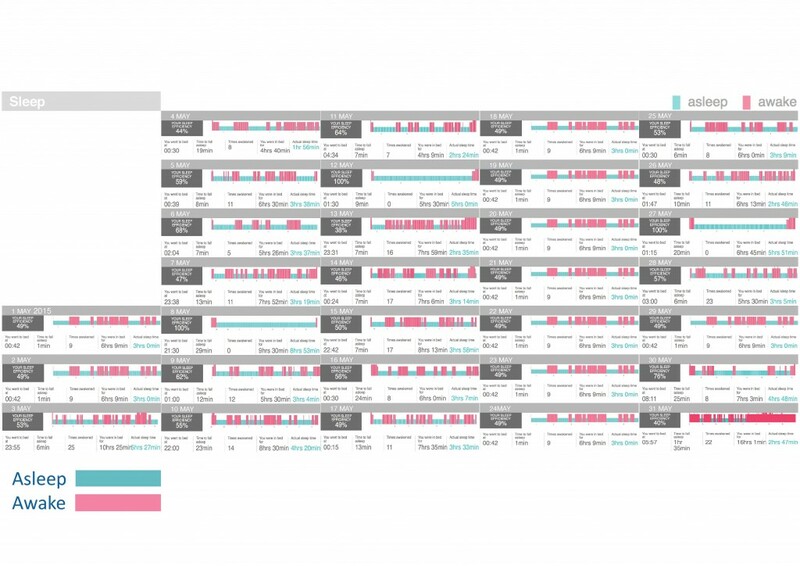 Time Geography is built around themes that provoke a search for ontological equilibrium, re-valorising the time of sleep as productive, harnessing the expressive quality of walking, and viewing time as an accumulation of stories captured in social objects and invested in material culture and practices. Tricia Flanagan. “BODY ecology” 2015, Detail of weaving, 200 x 150 cm, Indigo-dyed Merino lambs-wool, Timeless Textiles, Newcastle Australia, Photo courtesy of the artist, ©Tricia Flanagan. In the artwork BODY ecology, the sleeping state determines the depth of colour of a hand spun merino lamb’s wool thread that is drawn at a constant rate across a portable dying machine. 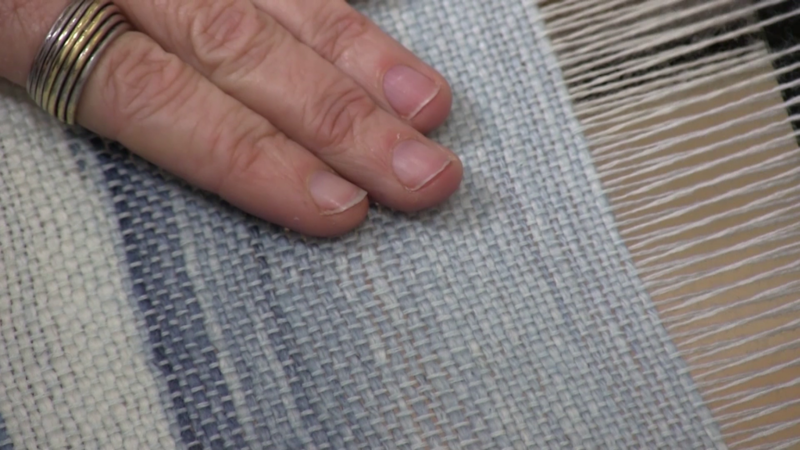 When the artist is sound asleep, the thread dives deeply into the indigo dye bath. When lightly sleeping or stirring, it is drawn shallow or skims the surface. During the day, the resulting variegated coloured thread is woven into a blanket, which in turn becomes a physical embodiment of the ontological experience of sleep. Across contemporary culture we are facing a sleep crisis. The on-going acceleration of modernity is one in which everything is incrementally speeding up. Consequently, there are always better things to do than sleep. This is an attention economy that we like to think that we are choosing to consume. Our impulse is to consume our own insomnia through the customisation of sleep in order to work around deadlines or lifestyles. Our sleep cycles are therefore no longer in tune with diurnal time. 24/7 electric light, neon cityscapes and the proliferation of electronic screens stimulate us to stay up later every night, and every morning the mechanised time of our alarm clocks wake us. Then, on weekends we binge on sleep in a vain attempt to catch up. ‘Social jet-lag’[i] _is the result of this on-going conflict between biological and social time and takes its toll on the body by manifesting in numerous health issues. Research has linked sleep to memory, learning, metabolism and the immune system. Sleep deprivation leads to health consequences such as obesity, hypertension, diabetes and cancer, and is linked to diseases such as chronic heart failure, chronic obstructive pulmonary disease and Alzheimer’s disease[ii]. Somewhere at a deeper level, our hermeneutic goal is to return to healthy sleep – yet it seems that the healthy sleeper is not revered in our culture. Critical sleep theory considers the history of sleep culture and acknowledges its problematic contemporary condition. The industrial revolution had the effect of mechanising time as labour and commodified time into productive and non-productive time. Prior to the industrial revolution we slept in different ways. During medieval times, many slept in shorter blocks of three or four hours rather than eight hours a night. In many ways, sleep is considered a weakness that overcomes us. We embrace a work ethic that only sees value in productivity and places taboo on sleeping in public. Homer famously referred to sleep as ‘death’s brother’. Tricia Flanagan.“BODY ecology”, 2015. Detail of blanket, lambs-wool, indigo, 200 x 150 cm, Centre for Mobilities Research, Lancaster University, United Kingdom, Photo courtesy of the artist. ©Tricia Flanagan. BODY ecology is an installation that generates bespoke blankets from sleeping participants. Steve Mann describes humanistic intelligence as the synergy between human and computing systems, where both operate as if they are one organism, circumventing any conscious operative narrative. Each blanket is generated through the process over a month of sleeping and weaving. Our technological tools continue to evolve the way we think, the way we behave and the way we interact. Technology is increasingly mobile but the current generation of wearables does little to address this new mobilities paradigm. By contrast, its focus is the quantified self-promoting commodified gadgets and competitive individualism. We live increasingly digitally mediated lives, and this environment creates new points of perspective. Technology is increasingly embedded into our everyday lives, in the building blocks of our cities, the textiles on our bodies, and under our skin. Time Geography provokes an alternative dialogue found at the intersection of these multi-layered networks and systems. What is the body ecology of the digital native? How can we better leverage and augment the affordances of the body? How can we create systems of empathy, cybernetic systems that connect our minds/bodies/environments into emotionally sensitive and responsive organisms? How can we break away from unsustainable systems of endless commodity production and create circular economies, perhaps more like gardeners – seeding growth while fertilising future crops. Imagine our cities as biological bodies and our bodies as wetland eco systems of floating islands. This inversion helps us perceive the extension of our bodies as agentic actors in larger networks. Central to Tricia Flanagan’s practice are notions of mobility, the nomad, the Shanachie, peripatetic people and interconnected systems. She situates herself, and her work, in cultural borderlands, between East/West Germany and Hong Kong/Mainland China. Like many of her generation she is increasingly mobile and moving around the globe is a normal part of her work and leisure. 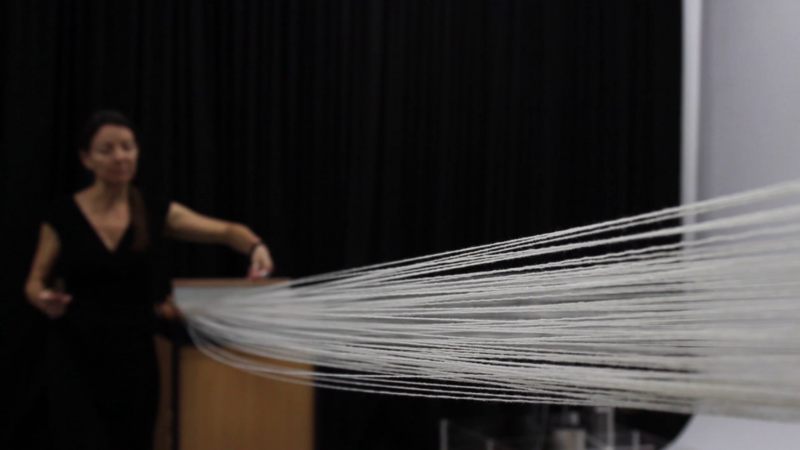 Generative Textile Systems is based on a simple equation – one knit stitch equals one step. The end of walking each day is denoted by a buttonhole stitch. Therefore if the body is inactive, the fabric generated will have many holes creating a lace like pattern. By contrast, a very active body will create a plain fabric with few holes overall. Two additional parameters provide the cloth with a rich texture of meaning. The thickness of the yarn is determined by the temperature – which is thinner in hot weather and thicker in cold. 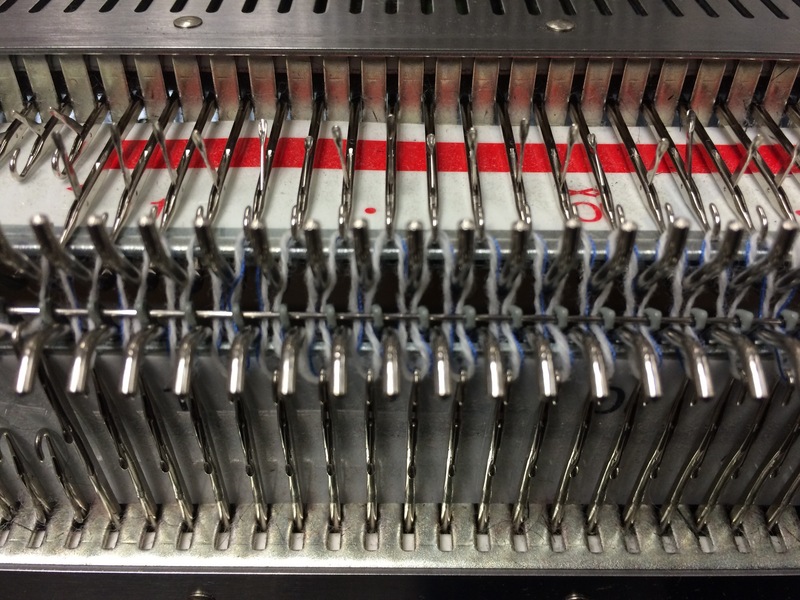 The system also includes 300 colours, which are inlaid into the knitting machine whilst working, mapping the temperature and humidity across a spectrum of +40 to -40 degrees centigrade. During 2015, Flanagan visited Australia’s Snowy Mountains, Hong Kong, Lancaster UK, Ireland, Taiwan, Australia, Hawaii, USA, and Canada. In Hong Kong the high temperate humidity gave saturated colours across the blue green spectrum and generated predominantly single ply. Flying from the heat of Hong Kong to Lancaster’s cold weather produced a sudden thick section across a garment and a change of colour. Body worn sensors record biometrics, temperature and humidity and send them via Internet to the knitting machine. The artist then works directly with the data feed, translating the colour and thickness into simple garment shapes designed specifically to suit the style of the participant. In this way garments are created for the participant that are marked by the memory of the environmental conditions and the activity of the body in a particular space and time. The co-evolved possibilities of the person as computer are also known as humanistic intelligence[iii] and can be viewed as part of our natural evolution. We have a long history of augmenting our bodies with prosthetic materials. Evidence of wound dressings used to aid healing, for example, has been dated to 1500 BC. Plates from 1597 by Gaspare Tagliocozzi (a surgeon from Bologna) illustrate Autograft procedures for replacing a nose. ‘Materials used in reconstruction of the nose bridge alone have historically included rubber, celluloid, iron, copper, platinum, ivory and gold’[iv]. The future will include on-board interfaces, augmented sensory perception, authentic self, and cloud memory. Tricia Flanagan. Generative Textile Systems, 2015, Detail of Merino lambs-wool, knitting machine, dimensions variable, Hong Kong Wearables Lab, Photo courtesy of the artist, ©Tricia Flanagan. Wearable technology enables mobility and changes the way that we live and interact. Flanagan’s research is founded on the premise that current wearable technology design practices represent a reductionist view of human capacity. How do we develop wearables that foster our senses rather than dull them? The democratisation of technology into work, play, home and mobile social networks in recent years, has seen traditional Human Computer Interaction (HCI) design methodology broadened through the integration of other methodologies and knowledge from the humanities such as social science, anthropology and ethnography. The field of HCI is inherently interdisciplinary and its history is one of the inevitable disciplinary multiculturalisms spawned by the expansive impact of technological growth. Rather than traditional functionalist approaches to design, Flanagan’s research engages cultural, experience based and techno-futurist approaches. Wearable technologies are therefore valued in terms of their critical, political, ethical and speculative potential. Wearables can enhance a relationship between designer and user who can become co-producers, and connect materiality to anthropology and the lived experience of the individual. The self and the social politic of wearable technologies span across macro to micro perspectives. Within this vast space, we might consider wider supply and production chains and regulatory systems – whose existence shapes the production and meaning of wearables (both their material form and design) – and the movement of gathered data from the body into wider dispersed networks of power. In moving from the micro (technology/body) to the macro (systems of production) we might consider where control lies across these networks, at which unit of analysis, and respective impact as they shake out into the world. Significantly, wearable technology can augment our perception, what we are witnessing is the emergence of a new paradigm as our awareness and sensitivity expands to include both macro and Nano perspectives. As wearable technology becomes integrated into our clothing and our bodies it will become our normative environment. In this for-see-able future, we will live with an amplified awareness of the instability, fungability and interconnectedness of things. Flanagan’s research, together with artists such as Nancy Tilbury, Di Mainstone and Thecla Schiphorst, is concerned with exploring ways to enhance the somaesthetic capacities of the body by questioning: How is our embodied materiality affected by emerging technologies? What is the relationship of the self to the proliferating wearable technologies? How is our sense-of-self changing as new technologies mediate the space between our experience of self and the world? [iv] Tobias, J., Artifical skin: Ingrown and outsourced. In E. Lupton, & J. Tobias (Eds. ), Skin: Surface, substance + design, p. 47. Princeton Architectural Press, New York (2002).